2015 Skoda Superb 1.4 TSI 150 hatchback review | What Car? What a car the old Skoda Superb was: big, comfortable, well-equipped and great value for money. This latest version builds on all that made the previous car so good. Despite being lighter, which helps fuel economy and emissions, it’s even bigger inside and packed with more features, while still being excellent value compared to the competition. In fact, in a recent group test with the Ford Mondeo and Volvo S60, it secured a healthy win. That was for the diesel version, but Skoda offers a range of petrol engines too, from 123bhp to 276bhp. This mid-range 148bhp 1.4-litre turbo is likely to be the most popular choice, tested here in equally mid-level SE L Executive trim. What’s the 2015 Skoda Superb 1.4 TSI 150 hatchback like inside? If you’re tall and often find that cars don’t give you enough leg or head room, then this Superb might be the car for you. It’ll cater for all sizes, with a fully electric driver’s seat and a height and reach adjustable steering wheel. The wide, comfortable seats are trimmed in Alcantara and offer all the support you could need on a long journey, while the dashboard’s excellent ergonomics mean that no button is a stretch too far. Perceived cabin quality is right up there with class-leaders like the VW Passat, using a proliferation of top-notch materials and softly damped switches. Because this car is so large, you need to be able to see out of it easily. Forward vision is excellent, helped by slim windscreen pillars, but the view over your shoulder could be better – blame the wide rear pillars. However, rear parking sensors are standard on this SE L Executive model, and for extra assistance when maneuvering into tight spots, a park assist system is an option. Not even a Mondeo can offer this much space in the back. It’s like travelling first class, such is the head and leg room available. The Superb is also one of the few cars in the class that will seat three adults in the back in relative comfort. With class-leading boot space, there’s also plenty of room for luggage as well. This model comes with an electric tailgate, which opens to reveal space for several large suitcases without the need to fold the seats down. If you do drop the backrests, the only disappointment is a large step in the extended boot floor. 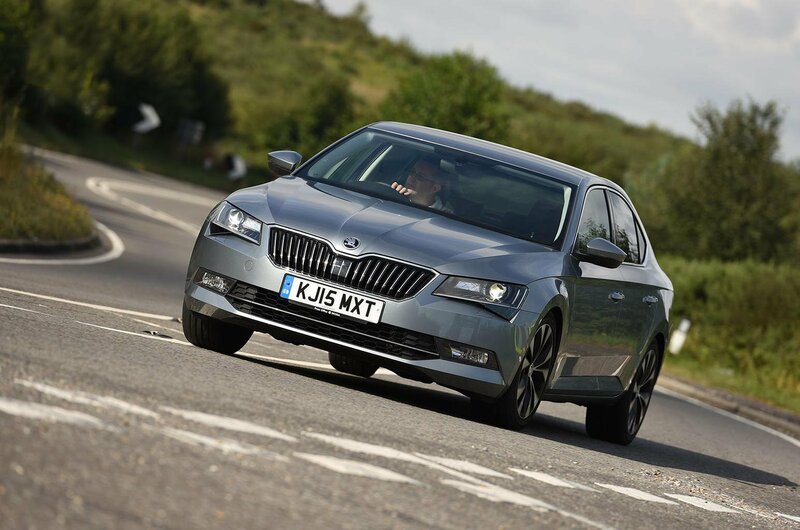 What’s the Skoda Superb 1.4 TSI 150 like to drive? Can a 1.4-litre petrol engine pull a car this big? Well, yes, as it happens. Acceleration is brisk, with 0-62mph dealt with in 8.6sec, and from 1500rpm to the red line it revs willingly. It doesn’t have as much shove below 2500rpm as the TDI 150 diesel though, so an extra gear change might be required if you get caught at low revs going uphill. However, the six-speed manual gearbox is slick, and there’s a DSG auto option available as well. Fuel consumption is impressive; on a four-hundred-mile trip it averaged 44mpg, which means that, driven carefully, it could go for over 600 miles between fill-ups. This petrol engine is noticeably smoother than the diesel, sounding sweet even when pushed hard. There’s no perceptible vibration through the steering wheel or pedals, and the engine stop-start system is less jerky, too. There’s some road noise over coarse surfaces, but little wind noise at speed. The steering might not provide a great deal of feedback but it is more consistently weighted than the Mondeo’s. It doesn’t have the Ford’s handling finesse, but, as with all Superbs, the trade off is a soothing ride that works well in town or at speed. It's difficult to think of many reasons why not. The Superb is an excellent choice, and this petrol engine does nothing to dent its claim to being one of the best family cars available. It’s smoother to drive than the diesel, performs well and has reasonable running costs. On top of that it costs £900 less to buy and is currently cheaper on company car tax than the 148bhp 2.0 diesel. Bear in mind, though, that will all change in 2016, when new rules scrap the diesel surcharge. From then on, the petrol version will cost about £100 more per year in company car tax for a higher-rate taxpayer.